The first two days were devoted to briefings by the UK government officials and their research staff and panel discussions with the visiting scholars and practitioners. On 04 December, interaction between the senior policy advisers of the Foreign and Common Wealth Office and UK’s Ministry of Defence and the delegates to the conference took place. Mr. Patrick Moody outlined the UK policy on Afghanistan and reasons for the same. Broadly the aim was that Afghanistan does not pose any threat in future particularly to UK and to the region and the international community in general. He spelt out some details of how UK was implementing its policy objectives through its contributions towards creating a viable state. Besides its aid efforts, UK was also active in encouraging the negotiation process with Taliban for eventual political reconciliation. Ben Fender, Political Counsellor at the British Embassy in Kabul happened to be in town and he explained the complexities of the reconciliation process. The delegates did make some observations on the reconciliation process and expressed a degree of skepticism in the manner the negotiations have proceeded so far. However, there was a general consensus that successful elections may create conducive climate to recommence the reconciliation process. A trilateral conference on Afghanistan’s future between scholars from Royal United Services Institution, VIF experts and researchers from various Chinese think tanks was organized in London from 04 to 06 December 2013. The VIF delegation was led by its Director Mr. Ajit Doval and comprised of Gen. (Retd.) NC Vij, Amb. TCA Rangachari, Lt. Gen. (Retd.) Ravi Sawhney and Brig. (Retd.) Vinod Anand. The Chinese delegation was led by Dr. Hu Shisheng, Director of Institute of South and Southeast Asian Studies which is part of China Institute of Contemporary International Relations. The main objective of the discussions was to gaze into future and assess as to how peace, stability and prosperity can be ensured once the western troops leave Afghanistan at the end of 2014. The next stop was at UK’s Ministry Of Defence where it was explained that significant risks of the security situation worsening remain. Weak leadership and corruption in Afghan National Security Forces, high attrition rates, lack of logistic support including equipment and funding issues to sustain the force need to be further addressed. It was also noticed that the UK along with its allies was working to develop Afghan National Army as a counter insurgency force and not as a regular army that can defend its borders from any adventuresome neighbour. The parting thought was that the UK would be doing less but in a more meaningful way. On the second day, an interaction with held with Rt. Hon. Richard Ottaway, Chairman of the Foreign Affairs Committee. The objective of the Committee is to exercise close oversight over the foreign policy so that it goes in the right direction. 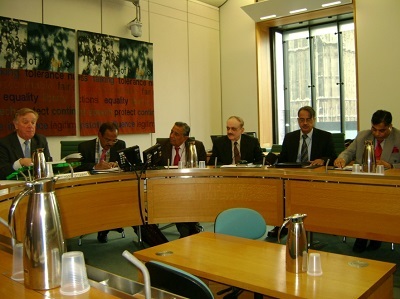 Post-2014 situation in Afghanistan and UK’s policy objectives were discussed. There was exchange of Indian and Chinese perspectives on the issue. Thereafter, a panel discussion involving the staff and researchers of UK’s Department of International Development was held. Each side explained the trends and challenges of the Afghan economy and how best a successful economic transition can be ensured in post 2014 Afghanistan. This was an area where India, China and the UK could cooperate and help stabilize the situation in Afghanistan. Later, a visit to Cabinet War Rooms was also organized.